Okay, I couldn't help myself. Here's what we brought Dublin back from our cruise, doesn't he look ready to go to Mexico? Maybe next time pup. In my usual vacation style, most of this post will be pictures. I'm sure there will be other posts to follow. I have a lot to cover. Here's Miami as the ship was leaving. It was our first time in Miami, I don't think I would go back just for a vacation but it was fun to stay for the night. Here we are on our first formal night. Don't we look lovely? Our first stop was Grand Cayman. Here's a picture in Hell (yes that's the town's name, you can see why). Here we are, looking happy in Hell. Next stop in Grand Cayman was the Turtle Farm, I was pretty excited for this activity. We got to actually pick up the turtles. They raise turtles here to eat. These are just babies, the other ones were so big! None of my pictures of them turned out so great though. We learned there's no limit to how big a turtle can grow, it's only limited by how much food it can find. They feed there's like 10 times a day no joke so they grow to be 100's of pounds. This was my first time snorkeling ever (Shad's first time when there was something worth seeing) and I loved it! I definitely would do it again (and did!). 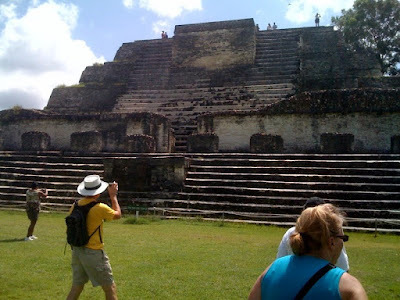 Our next cruise stop was Belize, it's the country that borders the south part of Mexico and Guatemala. 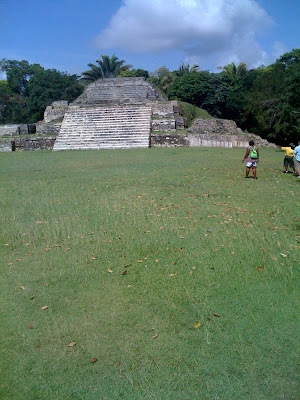 Here we opted to go visit some Mayan ruins called Altun Ha. It very cool to hear the history of the specific buildings and see the amazing things the people were able to build with such primitive means. On our way to the ruins, we also got to have a little city tour. If you're looking for cheap land, Belize is the place for you, the government gives it out (to anyone!) all you have to do is build something on it, you don't even have to finish that something. 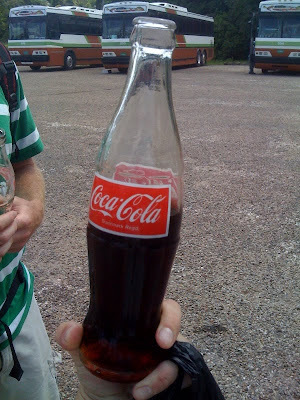 There's only a Coke plant in Belize so no Pepsi or Dr. Pepper for them but they do get to have Coke made with real sugar and in glass bottles. So delicious. 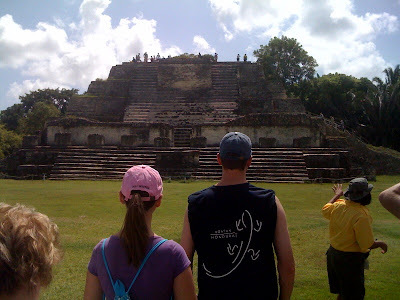 Our last stop on the cruise was Cozumel, Mexico. We didn't really do anything exciting here, we took a Taxi to a beach with all sorts of water toys and relaxed there all day. It was fun but it felt exactly like all the other Mexican cities I've been to. 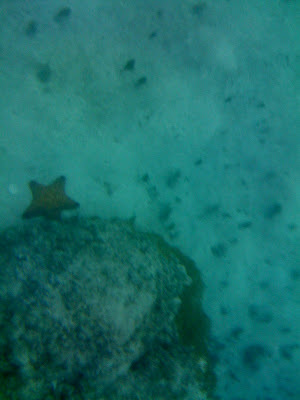 While snorkeling at the beach, we found Patrick Star next to his rock. And yes, I took this picture underwater with my iphone using the bag my camera previously used for snorkeling. More on that later. All and all it was a good vacation. Would I cruise again? Honestly, probably not. We can get into those reasons in another post for now, just imagine yourself on a warm beach listening to the waves. I loved Cozumel for the ruins (small ones) and the snorkeling but I can see how, since you did those things in two other places, that it wasn't too exciting. If you ever go back to Grand Cayman I HIGHLY recommend going out to Stingray City. You get to swim with the stringrays and even catch them, if you dare. Looks like you got to see lots of cool stuff. Sorry it didn't go so well! That was the up-side to going with my family is we filled our own dining room table and didn't have to share with strangers. Oh my crap, you guys chose the best cruise ever. Belize AND Roatan? puchica! that's cool. remember how I'm from Honduras? Very cool. Oh and You're crazy for putting your iphone in a bag underwater, super crazy.